This video really took me back – it really portraits Galway and the Irish how they are these days. Have to admit, it kind of made me miss Ireland. A found these great pictures taken by Fair View Design of the recent snow storm in Ireland and thought I had to publish them. The snow storm in Ireland I experienced will be stuck in my memories forever. It was my last month in Ireland and the heater war broken and it was weekend and nobody would come out to fix it. Great images, great trad and a good story. While traveling through Ireland with Irish poet, James Kelly, we stopped in his home town of Ballybunion in County Kerry and visited his father. Later that day, inside DJ’s pub, papa Kelly sang a traditional Irish ballad in honor of his wayward son… I cut the song with some footage I shot of Ireland while traveling with James. – Need sun in the winter? And hang out with the locals. This is the walking hat made in northwest Ireland of tweed, the fabric preferred by the Emerald Isle’s sportsmen for centuries. Crafted from Donegal tweed, the same locally raised 100% wool fabric used when it was originally made in 1968 to be paired with blazers or sweaters, its varied flecks and blends of color are the result of centuries of tweed-making skillcraft. It is fully lined with viscose taffeta and has a sweatband and taped interior seams. The hatband has a removable feather . Ireland has some rough weather. And while living there I experienced some. Huge waves, wind, hail and snow. Therefore the winter month are very popular with surfers. And you will see surfers in the water in their wetsuits all year around. it’s pretty modern and offers a great value. It’s very close to Dublin’s city center. Tucked Away In Quiet, Suburban Dublin, Clontarf Castle Hotel, With Its Magnificent Entrance Hall, Hanging Tapestries, Mysterious Doorways And Roaring Fires, Is Located Two Miles From Dublin City Centre And Five Miles From Dublin Airport. Some Of The World’s Most Famous Horse Racing Tracks Are Near The Hotel, Including Fairyhouse, Leopardstown And The Curragh. Golfers Will Be Spoilt For Choice With Several 18-Hole Championship Courses Nearby. All-ireland Club Rugby Is Played Within Walking Distance, And If The Season Is Right, Guests Can Catch An International Cricket Match In Castle Avenue. Guests Can Dine At The On-site Bistro, Which Serves Modern Dishes And Fine Wines In A Midiaeval Atmosphere Complete With Chandeliers And Traditional Pewter Goblets. The Casual, Contemporary Pub Is The Sort Of Place A Dashing Young Knight Might Be Found Practicing The Finer Points Of Chivalry While Downing A Pint Of Stout; The Bar Is More Refined, A Place For The Graduated Knight. Conference Rooms Cater For Meetings Of Up To 500 People And Come Equipped With The Latest Audio-visual Equipment. The Concierge Can Assist With Booking Tours And Restaurants And Can Also Advise On The Area’s Best Attractions. Irish Car Rentals and Ireland Blog got together to offer you the best prices on car rentals out there. Don’t believe us? See for yourself. You can rent a small compact car for around 17 Euros a day. Try finding it somewhere else. Ever wondered if you should visit Ireland or not? Well, after watching this movie you will find yourself booking flights right away. It has been pretty quite on this blog and I was wondering would I should do with it. Sell it? Nay … too many good memories. So I have decided to keep blogging but mostly with Ireland tourist information. With hotel and hostel recommendations and general Ireland Tips and Tricks. This a great place to stay when exploring the Sligo area … for example hiking the Benbulben. Only 10 minutes drive from beaches, golf clubs, horse riding and the stunning scenery, which make the North West that unique place for your special holiday. At Yeats Village you will find a selection of facilities to enhance your stay. Shops, Pubs, Restaurants and Sligo Town Centre with it`s entertainment venues are all within minutes walking distance. 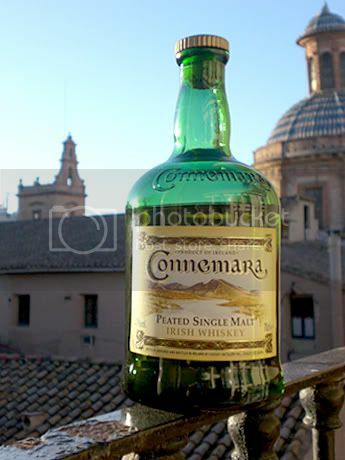 I am not a big Whiskey drinker but since a friend of ours introduced us to "Connemara – Peated Single Malt" Irish Whiskey I found my new favorite liquor. This is the best tasting whiskey I have tried. You can taste the smoky barrel, honey and if you take big sip you can even see the green hills of Ireland before you. So I bought a bottle and put it one in our moving boxes, as a treat for us when they arrive here. 2 weeks late, the boxes are finally here and as you can see the bottle is cracked open. Cheers! What is your favorite Whiskey – talk about it on the Ireland Forum.